Blog posts have been few and far between recently, and the main reason is that it’s been rainy and overcast every time I thought to take out a camera. I almost caught a break the other day, but soon after I started taking pictures, the clouds swooped in. And once you start the yogurt-making process, you can’t stop and wait for the sun to come back out. Before you start, make sure anything that will come in contact with the milk and yogurt is completely sanitized. I usually bring a stock pot full of water to a boil, and toss everything in for a few minutes. Your milk/yogurt mixture will be cooking around 110 degrees for several hours, and if you haven’t cleaned everything to death, you’re just asking for a germ party. Once you’ve sanitized, pour the half gallon of milk into the pot. I used a fancy local whole milk that is not homogenized, but any type of whole or 2% milk should work just fine. I like to sweeten my yogurt slightly by adding a scant half cup of sugar at this point, but you can either omit it or adjust it to taste. 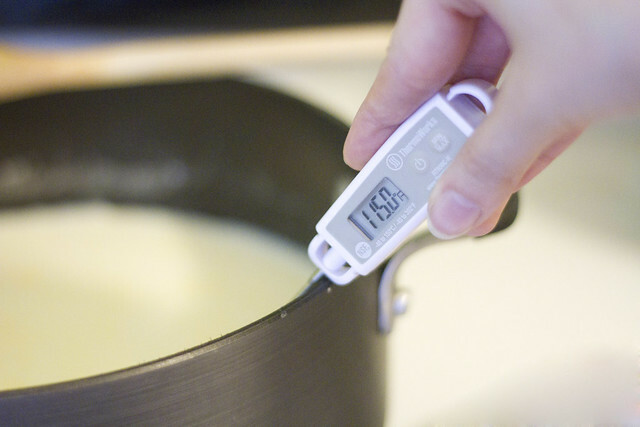 Heat it to between 180 to 190 degrees, stirring frequently as it reaches temperature. This step kills off anything that may be floating around in your milk before you incubate it. Allow the milk to cool to around 115 degrees. Working quickly so your milk doesn’t cool too much, stir a few tablespoons or so of milk into a few large spoon fulls of yogurt until combined. Doing so makes it easier to evenly incorporate the yogurt into the milk. Pour the yogurt mixture into the milk, mixing well. Transfer the milk/yogurt mixture into the container it will incubate in. The milk/yogurt mixture has to remain at a constant temperature of 110 to 120 degrees for 6-10 hours in order to become yogurt. Some ovens maintain this temperature with their pilot lights on, but mine does not. If yours does, you can pop it in and set a timer. 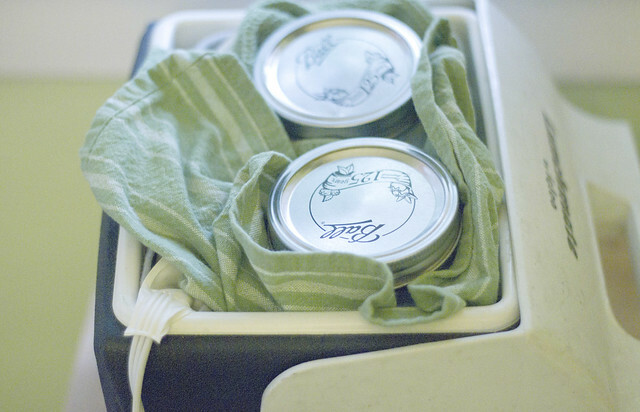 I create a warm environment by putting a heating pad in an old igloo cooler and insulating the jars of milk/yogurt mixture with clean kitchen towels. If you’re planning on adopting this set-up, test it out first to determine which heating pad setting is ideal for keeping the mixture around 110 degrees (I use the highest heat). The longer you let your milk mixture incubate, the tangier your yogurt will be. I like to make only slightly tangy yogurt, so I usually stop the process after six and a half or seven hours. When you’ve decided your yogurt is done, you can dismantle your makeshift incubator (or take it out of the oven, as the case may be). You’ll notice the mixture is definitely more yogurt-like than it was before, but it’s not done yet. A byproduct of the yogurt-making process is whey, a yellowish liquid that you’ve probably seen accumulate in yogurt and sour cream after it sits in your fridge for a few days. If you like watery yogurt, you can stir yogurt and whey together and put it in the refrigerator– you’re done! I like thick, creamy yogurt, so I drain the whey out. 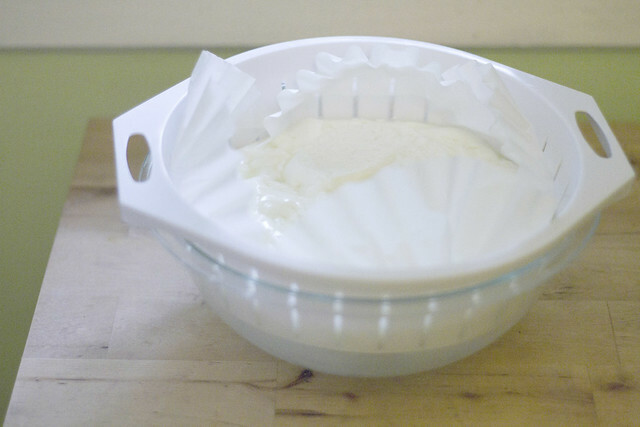 To strain out the whey, put a few coffee filters over a strainer, and put the strainer over a bowl. Pour in the yogurt, and let it sit in the fridge as it drains. I give it a couple hours so it gets really thick, and I stir it every now and then so the whey drains evenly. Once you’ve reached the desired consistency, transfer your yogurt to a container and discard the whey. You’ve made yogurt! I like to have a bowl of this every morning with a few ripe berries over top. 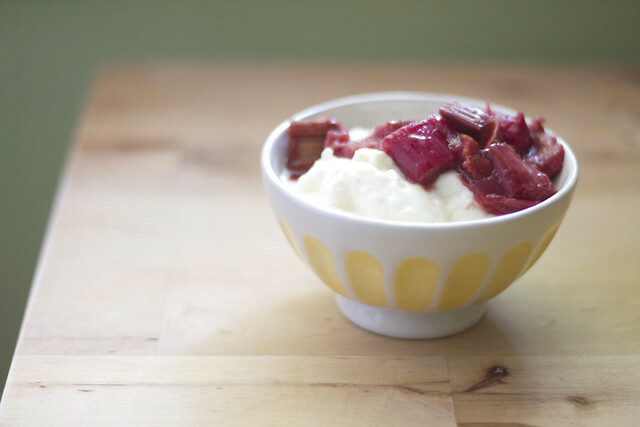 Or, top it with some of this roasted rhubarb, if you’re lucky enough to have a batch in your fridge. Posted on June 28, 2011 by Jessica This entry was posted in Experiments, Food. Bookmark the permalink. It’s delicious! I would eat a gallon if I could. Don’t discard the whey! There are so many great things you can do with it: http://faithfulprovisions.com/2010/03/31/whey-cool-uses-for-whey/. Homemade yogurt is so delicious and this method is so easy, I have a feeling I’m going to have lots of whey to play with. My favorite thing to do with it is make homemade ricotta. Blueberry, lemon ricotta pancakes loom on the horizon. Thanks for the whey info! I kind of had an idea it had a purpose, but I never took the time to look into it. And those pancakes sound incredible– I may have to follow suit. Can you use Stevia or an artificial sweetener, or is the sugar necessary to feed the “fermentation” as in making beer? Yayy craftzine! This recipe looks fantastic, definitely something that I need to try some day. Especially considering the fact that I spend ridiculous amounts of money on poorly flavored peach yogurt. Harvest peach. What does that even mean?! OMG Thank you sooooooooo much for the tute!!!!!!!! I used to work at a doctor’s office and one of our patients would always bring a giant cooler of homemade yogurt for us that we’d fight over but I couldn’t even get the recipie out of her because my spanish wasn’t that good. But this looks so easy, and I have a giant thing of strawberries in the fridge that would taste amazing mixed into some yogurty goodness. I may just try this tomorrow. How much yogurt do you get after draining? I only got about 20 ounces by weight, less than a pint by volume from 1/2 gallon of 1% milk. That is lower than I had expected. Hi everyone! This looks fabulous, but as I am lactose intolerant and I do not like soy, I was wondering, can I use lactose free milk for this recipe with good results? Many thanks, I adore yogurt but it kills me to eat it! N J Gill– You can use any sweetener you like, or none at all. It doesn’t interfere with the yogurt-making process. Mel– I’m pretty sure harvest peaches are a marketing scam. But I think the next time I make yogurt, I’ll throw in some peaches and freeze it in my ice cream maker– peach frozen yogurt!! Ivory– Let me know how it turns out! Gary– I usually get somewhere around a quart of yogurt from a half gallon of milk. It’s likely that using 1% milk produces a smaller yield, because it’s pretty watered down stuff. Also, the amount whey you strain out can affect how much finished product you end up with. I’ve always had good results using whole and 2% milk. Debbe– Unfortunately, lactose is an essential part of the process– it’s the sugar that the yogurt culture consumes to produce lactic acid, which gives it its texture and makes it tangy. I do this everyday 🙂 I have so many frens and colleagues that ask for recipe…I can forward them this link! Thanks. 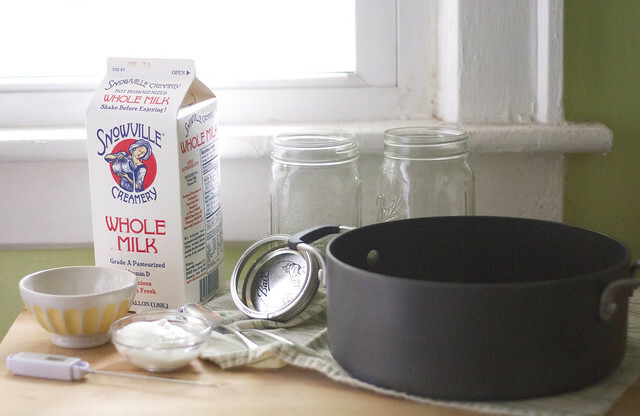 Some tips to add – I just pour half gallon of whole milk(pastuerized) in a large pyrex bowl (not till the rim, leave some room in the bowl for milk to rise) and microwave it on high for 10 or more(depends on the size of pyrex) mins. Use shallow dishes (pyrex bowls work best) than deeper ones. Let the bowl sit in the oven overnight where it is little warmer. you can freeze/reuse the culture you just made.